Showtime is showing an excellent documentary on the AFL marking the 50 year anniversary. The thing I enjoy most about it is that is sheds light on what is now the NFL. A lot of the names are still there; owners, coaches and all. It really rounds out what is today one of the best run businesses in the United States. Also marking this moment is Madden 10. They are getting in the act by releasing a add on pack that includes uniforms worn by the teams that were in the original AFL. After watching the first part of the doc I'm considering checking this out. Now, as I seem to be developing a habit of, I'll say another thing about Madden 10. I finally finished my franchise season. I lost in the Conference Championship to Arizona. It turned out to be a barn burner. Arizona kicked a 57 yard field goal in overtime to beat me. Am I disappointed? Did Madden once again script a loss for me? I'll never know, but I will say that I enjoyed it. I mentioned before that the game was missing a few elements that make it a great title. A couple examples of this are the sameness of each game. The fact that fans are still in shorts in late December outdoors. 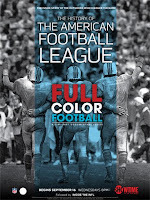 After watching the AFL documentary you realize the remarkably rich history of football in the United States and wish that more could be done to allow you to immerse yourself in that and really become part of it. I lot to ask for sure, but I think just changing some of the repetitiveness between games and adding more personality would go a long way. One curious thing to mention is that after the first franchise season you can go into an owner type mode with completely insane upgrades to your stadium. Enter: Valet Teleportation, HD screens at every seat and Food Replicators. Believe it. I actually found it refreshing and am going to get going on my team creation.